Georgia Tech-Lorraine is not just for engineers - all majors are encouraged to attend. Georgia Tech-Lorraine is perfect for all STEM majors with many core courses, and courses in your major. Take one intermediate or advanced course in French (2000 level or above), and you'll receive all the perks of this exciting program. All majors welcome; the remainder of your courses can be in English from the more than 30 courses on offer at Georgia Tech-Lorraine. This innovative program will be offered each Fall semester. Program started in Spring 2019 and going forward will be offered every Fall semester! Improve your fluency in French and learn more about sustainability, while living in one of France's most progressive "smart cities." Study French, STEM, Business, and Social Sciences at Georgia Tech-Lorraine in historic Metz, France. BONUS: The first 10 students to register in the program taking TWO upper level French courses will be credited back $500 for their tuition and fees! For more information visit the French-Sciences-Sustainability: French Immersion Program webpage. Georgia Tech-Lorraine is a great option for students who wish to do a joint BS/MS program. The joint BS/MS Program is a five-year program that features a seamless transition between the bachelors and masters degree programs. The last two years of this program can be done at Georgia Tech-Lorraine. Careful course planning can also lead to the award of a graduate degree from a French partner school. Did you know you can do undergraduate research at Georgia Tech-Lorraine in the Fall and Spring? Check it out on the course listings. Take from 1 to 3 hours of credit. Please contact Dr. Bertrand Boussert for information on the opportunities. 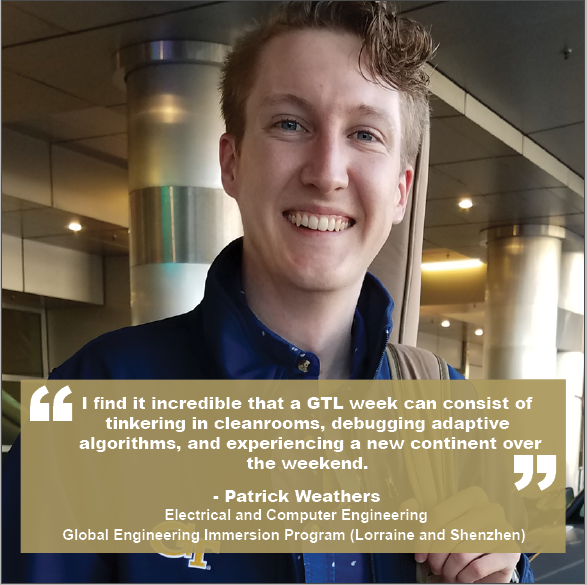 The International Plan is a challenging and comprehensive academic program for Georgia Tech undergraduates that develops global competence within the context of a student’s major. There are several courses that qualify not only toward Language Requirements, but also the Globally-Focused Coursework. Cross-reference the Georgia Tech-Lorraine course offerings with the International Plan class requirements.